^ ^ ^ ^ nice numbers Kalon. Yesterday Terry Burger dyno'd at Specialty Z and made some insane numbers...around 580/550 bone stock uncorrected on 93+ octane and then threw his piggyback on it and did something like 630/630 on 3-4 pulls and best yet no limps! Terry's going with us to Famoso this weekend and I'd love to see this thing break into the high 10's. 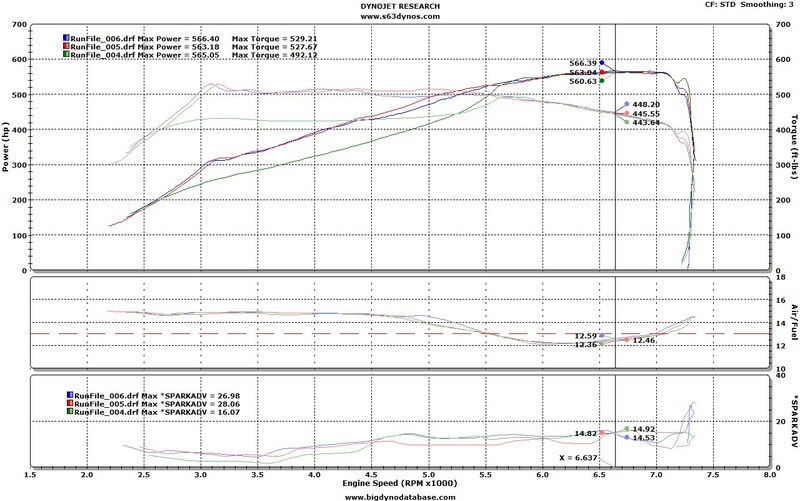 Those dyno results are already in the S63 Dyno Database @ www.s63dynos.com. Meet us at Famoso Saturday if u want some 1/4 mile data RG! That's a possibility. Let me check out the schedule. Thanks for the invite. Awesome let me know and I'll add you to my "crew" as it's a private event and they will need your info. This is the stock car that pulled 4 CLth's on the M5 with the "press" file. Hopefully he can make it to the event. Regular Guy - are these files available for download on the database yet? 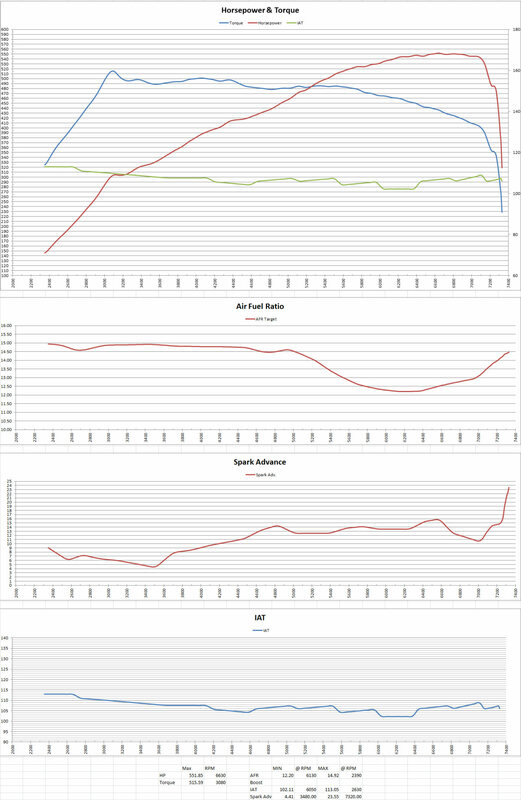 Also, what is up with the M5/6 data? Why would IAT's be going up then down so many times in the same runs? Im not discrediting you, but I have never, ever seen that. Do you think the cooling system is doing its job, or perhaps the software used to log it is not fully compatible with those? Lastly, what did you use to collect that data? Its good information and if readily available, im sure the masses would be able to use it and contribute more info. RG took the info collected from the dynojet drf files, it's not his measurements, he wasn't even there. 1. Click the links in the "Dyno Database" heading for the posts above. At the near top of the screen it says "Download Dyno Files." Click that link to download the files. 2. Go to the Dyno Database (in this case www.s63dynos.com) and click the link that says "Get Files" under the "Dyno Files" column. 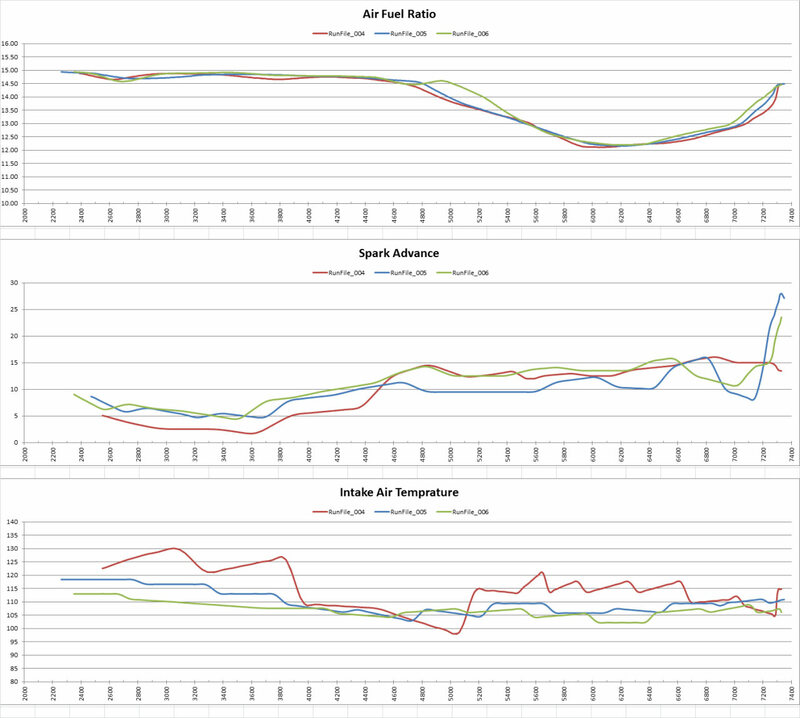 As Drew said, I just graphed the data that was provided in the dyno files; I wasn't even there. I don't think it's unexpected for BMW to modulate the IAT through the two intercoolers. If they are doing this, it would create the exact type of hysteresis you see in the graphs. To me, it would mean the intercoolers are not running free and are more efficient than they need to be. I believe EAS plugged directly into the OBD port to collect the data. The data would then be provided by the ECU itself in response to DCAN requests (a standard procedure and standard data request function). All OBD2 data is collected by Dynojet's Datalink Module (plugged into OBD port) so it can be graphed accordingly along with HP/TQ figures. Exception to the rule would be piggybacks (N54 variants), as they need to be disabled in order to free up the OBD2 port. This doesn't matter much as datalogging can be performed directly from the device itself. I meant are all those files available for download, the S65 and S63. as for S63, they have 2 or even 3 intercoolers yes? 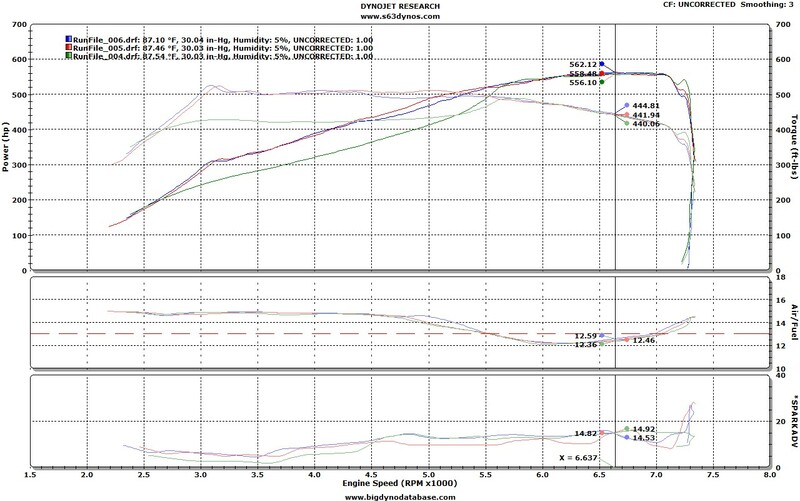 Yes for all the dyno results posted by me, all the files and the Excel spreadsheets are available for download through the Dyno Database (www.s65dynos.com, www.s63dynos.com). To avoid confusion, it's probably best to use the Dyno DB links in this thread, then download them as I described in #1 above. I believe the S63 has two intercoolers. Since your a whiz with this stuff, have you ever seen where files from 2 different DJ dynos are incompatible? If it's what I think, then yes I've seen it before. There seems to be some type of auto-scaling bug in the Dynojet software. After you load the files, click "Tools->Graph Options->Rescale." Or hit <CTRL-R> to rescale. See if this fixes it for you. it does not. I dont see why scaling would be off. And then there is another issue of boost readings all together. 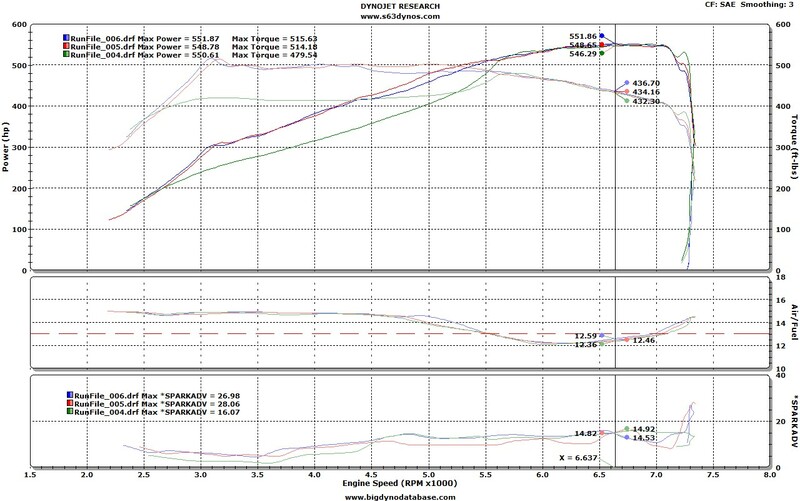 I've never had an issue comparing dynojet files, at least from the dyno jet you guys use in your area, with EAS, SpecialtyZ, and the Chatsworth dyno here in my area. I've also never head any problems reading different DRF files and comparing. I've got many files from back east. Quite a few from ICS and other places. Never a problem. I sent you my email via PM. Go ahead and send me some files and I will take a look. Great day and had a blast with the crew. Thanks for keeping in touch Drew, I'll see you soon at the big willow event! Thanks Brother, Feb. 22 is going to be a lot of fun.